Slone Ranger: Harper Lee's 2nd Novel debuts Today! To Kill a Mockingbird was first published by Harper Lee in 1960, on the cusp of a changing America. There was tension everywhere to be found - racial, sexual, political, and social. Some describe the era as a bubble that was ready to burst after years of hostility on so-called freedoms. So it was only fitting for the time to introduce a book that would challenge the notions of race in America. To Kill a Mockingbird addresses many socially challenging situations, both directly and indirectly, all through the innocent eyes of a six-year-old girl. Very thought provoking. Controversial or not, the book and the movie, which was produced 2 years after the novel's debut, are both still taught in many classrooms to this day. The author, native Alabamian (Nelle) Harper Lee, has received many honors for her only published novel, including the Presidential Medal of Freedom. Earlier this year, it was announced that Harper Lee would be releasing her second novel, some fifty-five years after her first, one, and only, publication to date. 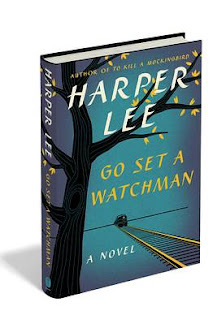 Obviously, due to the popularity of To Kill a Mockingbird, and the fact that Harper Lee was once closely tied to the famous author Truman Capote, which sparked its own controversy of the book itself, this book release is and has been highly anticipated. So, without further ado, Go Set a Watchman will be released to the public on Tuesday, July 14th. Buy the audible edition and Reese Witherspoon will be reading the story to you, what a treat!